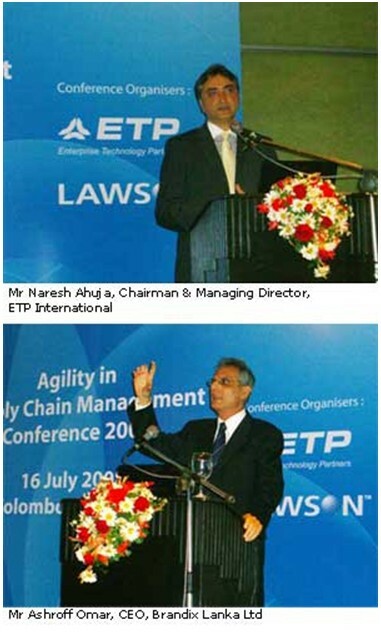 Immediate Release – The Agility in Supply Chain Management conference which was held on 16 July 2008 in Cinnamon Grand, Colombo, Sri Lanka drew over 100 senior representatives from leading companies in Sri Lanka. The half day by-invitation only event was jointly organised by ETP International, an international software solutions company and its partner, Lawson. The conference started with a welcome address by Rajkumar Jagasia, Executive Director of ETP International. He introduced ETP as an international software solutions company serving the technological needs of large and medium sized enterprises in the region by proving solutions and consulting services to the retail and manufacturing industries. The conference programme had a strong representation from leading business leaders and knowledge experts presenting expert knowledge sessions. Senior representation as speakers came from Brandix Lanka Ltd, Prima Group, Lawson and ETP. The first speaker in the lineup was Mr Naresh Ahuja, Chairman and Managing Director of ETP International. He presented on the emerging technologies that help organisations to increase operational responsiveness and illustrated how an organisation can streamline processes and embrace customers by reinventing itself through the use of information technology. Mr Ashroff Omar, CEO of Brandix Lanka Ltd shared with audience on the changes happening in the global business environments and what are the driving needs for supply chain efficiency in an organisation. He elaborated on how companies can achieve optimum levels of supply chain efficiency, benchmarking and how having an agile, responsive and flexible supply chain benefits an organisation..
Mr Rober McKee, Industry Strategy Director from Lawson delved into the challenges faced by organisations in achieving supply chain efficiencies. He drew reference to the international industry standards and how an organisation can implement step change performance management improvement from best practices to achieve the desired results. The final speaker for the event was Mr Tan Beng Chuan, Group General Manager of Prima Group of Companies who provided the roadmap to achieving an effective logistics and distribution management process, with an emphasis on the cost efficiencies and potential new revenue streams that it could generate. “The turnout for the event was overwhelming. 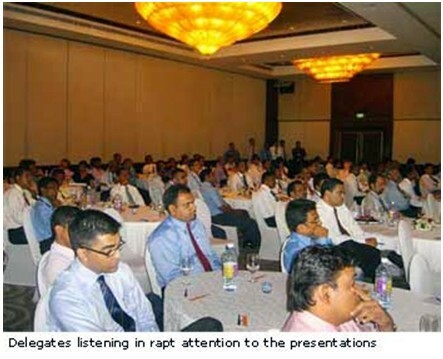 We have more than 100 senior representatives from the business community in Sri Lanka, far more than our expected 50! This clearly reflects the business community embraces conferences of this quality and the quality of speakers such as Mr Ashroff Omar of Brandix Lanka and Mr Tan Beng Chuan of Prima Group were natural draws,” remarked Mr Naresh Ahuja, Chairman and Managing Director, ETP International Pte Ltd.
“We plan to take a proactive role in the business community in Sri Lanka. Some of the top business houses are already our customers. We have a team of consultants who are in Sri Lanka working on various projects. We are confident that despite the turmoil that the country faces, the business community is resilient and far sighted to see the needs for adopting international standards in technology to support their business operations and growth,” adds Mr Ahuja. Delegates from the conference learned from the speakers that supply chains need to be agile in responding to changing consumer demands, hence responsiveness is very important. However in order for fixed facilities and people to be more agile there needs to be more intimacy between buyers and sellers so that they share demand information and thereby drive the supply chain together without creating bottlenecks. To drive an effective and responsive supply chain, organisations need to look at the use of a robust and flexible supply chain solution, benchmarking against international standards which ultimately results in cost efficiencies and a positive bottom line. The conference closed with a gift presentation ceremony by Mr Ahuja to all the speakers. Each delegate left the conference with the knowledge takeaways as well as an attractive door gift and conference proceedings from the organisers.